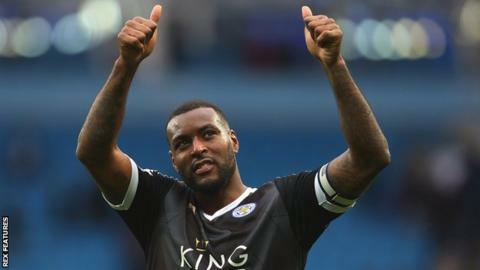 Leicester City captain Wes Morgan says he has not started talks about a new contract but is eager to extend his time with the Premier League leaders. The 32-year-old defender, who joined from local rivals Nottingham Forest in 2012, has a year to run on the three-year deal he signed in 2014. Morgan told BBC East Midlands Today: "I love it here and would love to stay. "But now I am focusing on what we can achieve as a group and trying to get over that finishing line." Morgan added: "First and foremost I need to concentrate on the pitch and see what happens after that." The Foxes have 53 points and are two points clear at the top of the table with 12 games remaining. North London rivals Arsenal and Tottenham have 51 points, with Manchester City in fourth place on 47 points.